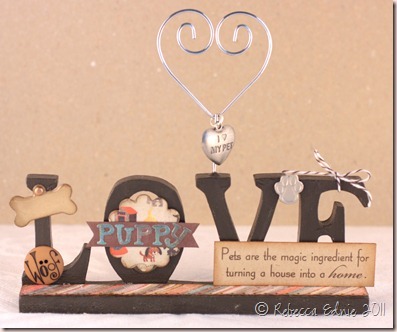 This was one of two doggie-themed gifts I mafe for my mom. She recently lost her dog who was 14.5 years old and she was devastated. And since she is hard to buy for, I pretty much have to make something to be sure she doesn’t already have it! This originally was a nasty yellow colour and I can’t imagine why anyone, even a dollar store would use it. I sanded it so the paint would grab and added two coats of acrylic paint. Then I covered it in Rock Candy Crackle Paint. 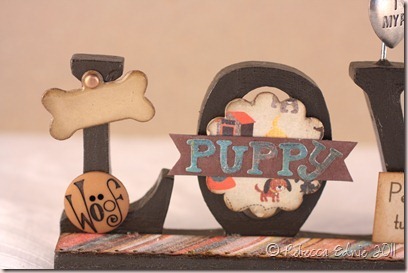 The doggie bone embellishment is a die cut from MFT which I covered in Glossy Accents. The scalloped circle is covered in Max and Whiskers paper and sealed. Then I added the banner; just the letters are covered in Glossy Accents. Paper: Max and Whiskers-Basic Grey, chocolate, kraft CS-SU!